Probably the most anticipated pirate game since Assassin’s Creed IV: Black Flag, Sea of Thieves closed beta ended almost as fast as it came. That is, unless you played The Secret of Monkey Island, in which case I applaud you. Until its official release in March, I hope you plundered to your hearts content! So far, my first impressions of this game are that you will have the most fun screwing around doing nothing. Let’s dive into deeper waters and unpack the treasures that be this closed beta! First off, the art design was aesthetically pleasing to look at. Everything from the water, trees, and different ships you can run into on your voyage have very rich color palettes. There are dark shadows where there should actually be shadows, and light from the lanterns around the shanties dance as though they were motion captured. It’s an amusing cartoonist style that Rare is famous for much like their Banjo-Kazooie games. By far the most entertaining thing to do was have your friend blast you out of a cannon onto a nearby island. Going on quests for hidden treasures, fending off sharks when your ship inevitably sinks, and engaging in comically hilarious sword fights with other players is what makes this game. Although there is no real storyline, the fun comes from making your own as it’s a shared environment with others. Sandbox games are becoming increasingly popular and Sea of Thieves is no exception. If you ever wanted to sail the seas while your mates play you sea chanteys, then you’re in luck. With the accordion and the Hurdy-gurdy, riding off into the sunset has never looked or sounded so cool…or whatever the pirate equivalent of “cool” is (I may or may not be listening to the soundtrack as I write this.) The sound of the waves crashing against the ship sounds as if you were actually on the ocean. Below, Sound Designer Guillaume Muller and Senior Sound Designer Jamie Hughes sit down to discuss how they made Sea of Thieves come to life. The whole series is quite interesting on different aspects of the game. Each video is pretty short, if you find behind the scenes information interesting, check them out! One of the coolest aspects is the co-op game-play. The deliberate design of the ship was crafted so that each person plays a role. Of course this isn’t necessary for navigation but you might as well call your ship the Titanic if you don’t sail smart. Think about this. You have your crew ready for a voyage. You, the captain of vessel Bo Jangles, take the helm while you command your mates to different areas. One in the crows nest to spot nearby islands, one at the bow (that’s the front for you land lubbers) to watch for rocks, and one below to navigate the map/compass. This makes for very cooperative play, and it can be fun to take on different roles. Tying up the knot on the metaphorical mooring lines for this game, cross-play was introduced as well. This means players on Windows 10 as well as Xbox can play with each other. This to me is a huge step in the right direction for not only Sea of Thieves, but the gaming world as a whole because this adds an element of community. Those who’ve built a PC know how expensive it is, so those with a console don’t have to feel restricted to only playing with others who have a console if they can’t afford the PC. 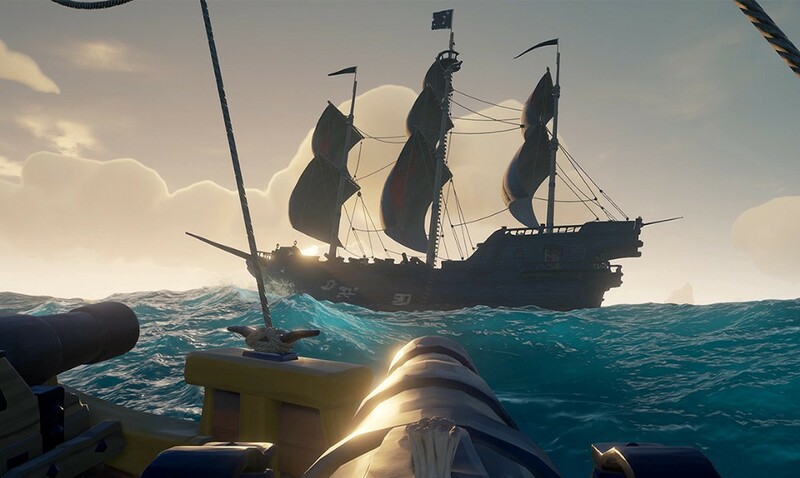 The team at Rare took into consideration the ideas of their community to craft an excellent experience for everyone involved by ensuring a welcoming experience. For example, they added lines of communication such as pre-determined lines of dialogue in case you don’t have a mic. On the same side of the coin, being able to put mutinous crew mates in the brig by voting with the crew from the menu, allows for a pirates code of ethics as it were. A couple of questions and concerns I have pertain to the amount of content and things to do in the game. At what point does sailing to an island to pick up treasure get repetitive? Is there a chance for expansion? With the release date being so close, I’m worried as to how long the game will hold up when we have other games such as Far Cry 5 (coming March 27th) and Monster Hunter World which is currently out. Another concern was micro-transactions. Hopefully if they do include these, it’s purely for cosmetic items. Even then I probably won’t pay money to have a cool flag on my ship…. Maybe. Don’t tell me how to live my life. Either way, I’m sure once released, Sea of Thieves will provide countless hours of fun for you and your friends. I see this being super popular with streamers who enjoy interacting with their audience and just want a chill environment. As an achievement hunter, I’m excited to see what is added although I can’t see it being too difficult to complete. Speaking of achievements, during the closed beta, it was possible to enter your own idea for what an achievement could be for the fully released game. Rare, you better have picked a challenging one, otherwise I’m comin’ for that booty! Let me know if you enjoyed the recap and I look forward to catching you on the virtual open seas!